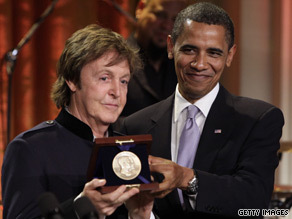 President Obama on Wednesday awarded Paul McCartney the Gershwin Prize for Popular Song – a lifetime achievement award given by the Library of Congress. (CNN) – House Minority Leader John Boehner is demanding an apology from music legend Paul McCartney after the Beatle took a slap at President Bush during a recent White House ceremony. President Obama on Wednesday awarded McCartney the Gershwin Prize for Popular Song – a lifetime achievement award given by the Library of Congress. Upon receiving the award, McCartney deadpanned, "After the last eight years, it's great to have a president who knows what a library is." The comments generated laughter and cheers from the audience in the East Room, but Boehner said the remark showed a "lack of grace and respect." "Like millions of other Americans, I have always had a good impression of Paul McCartney and thought of him as a classy guy, but I was surprised and disappointed by the lack of grace and respect he displayed at the White House," the Ohio Republican said in a statement provided to CNN. "I hope he'll apologize to the American people for his conduct which demeaned him, the White House and President Obama." Boehner spokesman Kevin Smith added the comments were "particularly offensive" because "the [former] president and first lady (who is actually a librarian) did so much for literacy." McCartney's comments came at the end of the ceremony and Obama did not reference them. Presenting the award, Obama said it was given "on behalf of a grateful nation, grateful that a young Englishman shared his dreams with us." I am tired of people from other countries coming into our White House and Congress and slamming the United States of America. I don't care about your political beliefs, we should all be proud to be Americans. People who come into our house should show respect to our country. I love Macca – his music means the world to me, but he's English and has no business making cracks about any of our leaders. Same with Russell Brand running his mouth about President Bush at the MTV Awards a while back. The UK and Europe has plenty of problematic leaders of their own; you don't hear American musicians and celebrities taking jabs at Angela Merkel or David Cameron. It is a disgrace on the parts of Obama as the host and that McCartney silly man as an United States' guest! Way to go Paul....what a hoot!! I agree with John Boehner on all counts. I was very disappointed by Mr. McCartney lack of respect and class as he was in the White House. I hope Mr. McCartney will do the right thing an apologize for a laps of good judgement. Perhaps John Boehner should think twice about being offensive – I find his political posturing offensive. Of course, this from a man who clearly spends too much time in the tanning booth and hair salon, and who is going to look very odd some day if Juviderm is recalled and he can't get injected on a regular basis. One reason Paul is such a powerful voice is because he speaks his mind and he is very smart. He didn`t care that back in the 60`s the Vatican condemned the Beatles as `satanic` and he won`t care today that Sen. Boehner was offended by his candid opinion of our last President. Boehner- "I was surprised and disappointed by the lack of grace and respect he displayed". That's funny, I don't remember him being that upset about President Obama being called a Nazi, socialist, or liar by other GOP members of Congress. Hopefully Boehner isn't too upset that I think he is windbag in the pockets of Wall Street and big oil. Paul McCartney is nothing less than a JERK for making such comments. What makes him so brilliant, and does he know what a library is??? He is just plain stupid, and how would he like it if we went to England and make some crude remarks about Queen Elizabeth and her family. George Bush may have come off as being stupid, but he was a much better president that what is in the White House now. It bothered me too. I also had so much respect for Paul McCartney. I just felt he lowered himself to politics and the statement was so not necessary and did not buy him anything. I was very disappointed and decided no longer to buy any of his music. (Like he'll care). He showed a lack of class as far as I'm concerned. McCartney just stated the obvious – everyone in the world klnows that GW Bush is an absolute idiot who almost destroyed this country in every way possible. Bush will be remembered by everyone in the world as the WORST PRESIDENT EVER. We love Paul McCartney.